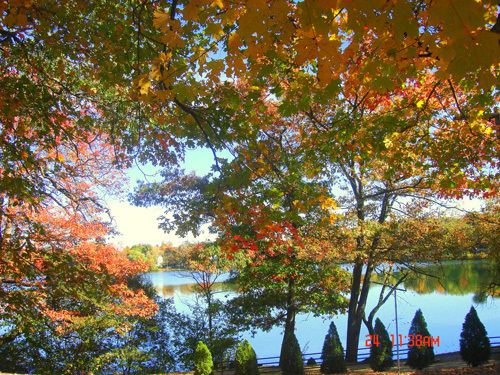 Walking, strolling and jogging around the Lake are possible along sidewalks and through the Coves and the new Crystal Lake Park in all seasons of the year. Fee-based public swimming is permitted at the Crystal Lake Park on designated dates in June, July and August. For exact dates, call Parks and Recreation at 617 796-1500. At these times, changing and restrooms are available, life guards are on duty and the aqualator1 is operating. Swim Lessons are available to the public and to local summer day camps. The facility is open each day of the week during daylight hours. Fishing is a popular sport at Crystal Lake. As early as 1871, the lake was stocked to provide for fishing. This continues nowadays with stocks of up to 400 brown and rainbow trout yearly. As these fish are not capable of breeding, the fish population is controlled from year to year. Boating is permitted in all seasons only from the boat dock at Cronin Cove. There is a boat unload/load zone for this purpose at the Cove. 1. "The 'Aqualator' creates a current that moves water through the swimming area without creating any turbidity problems and does not present a threat to the lake. Furthermore, the Aqualator appears to benefit the water quality in the swimming areas,"